Communications is a biannual social sciences journal founded by Georges Friedmann, Roland Barthes, and Edgar Morin. Soon after its start in 1961 it became a reference publication for media studies and semiotics in France and internationally. 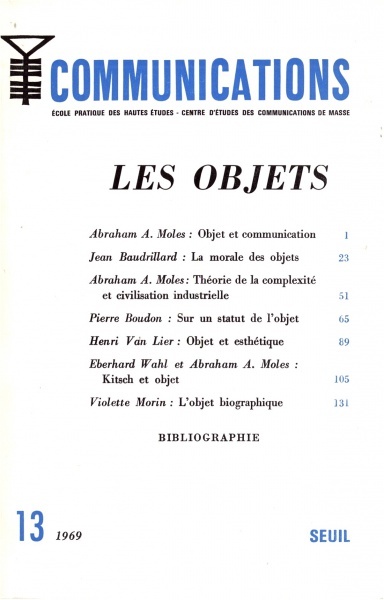 Its first 1969 issue was dedicated to the theory of objects, positioning it “at the confluence of sociology, political economy, social psychology, marketing, philosophy, design and aesthetics” (p 141). At the same time the journal argued for the relevance of the study of objects for governmental institutions such as “the Ministry of Industrial Production, the Ministry of Transport, the customs authorities, the courts, the counterfeits studies, or the National Industrial Property Institute” (p 141). It can be read as a post-May 1968 attempt to use the concept of object as an agent linking social sciences in order to increase their impact on direct political change, and as well as an early echo of what more than a decade later came to be known as the actor-network theory. Two years later the magazine appeared in its Spanish translation in book form. Thanks! I took it as a reminder to finally read it to its end. A great piece of work.